Monotreme is an order of mammals that are so odd, they originally confounded scientists and were at first thought to be hoaxes. Monotremes are egg-laying mammals, but that is not the only odd thing about them. The only other known monotreme is the echidna, or spiny anteater. Just about the only thing that the echidna has in common with the platypus is being an egg-laying mammal. Instead of the duck bill, it has a tube-like snout. Instead of being sleek and slim, it is pudgy and covered in sharp spines. Unlike the platypus, which is hard to see, as it spends days in a burrow and nights under water, hunting, the echidna is land-based in its food seeking and is regularly up and about during daylight hours. As a result, it is easier to both see and photograph echidnas. 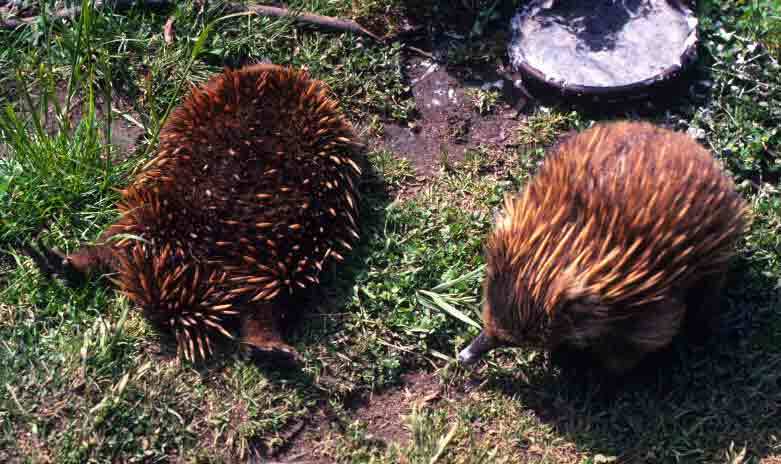 Echidnas, as their alternative name suggests, eat ants, as well as termites, digging into nests and mounds, inserting their log snouts and even longer tongues, and sucking the bugs into their mouths. (Echidnas’ tongues, by the way, are six to seven inches long, which is fairly astonishing given that the echidna itself is only about 14 inches long.) In a pinch, they’ll also eat worms, grubs, or beetles. When in danger, the echidna digs rapidly straight down, then rolls into a ball and erects its spines, presenting a daunting array of bristles to would-be attackers. Echidnas have adapted to a wide range of climates, and their appearance varies accordingly. Those in cooler Tasmania have longer fur—almost as long as their spikes— so the bristles are not quite so much in evidence when they are not in a defensive posture. Echidnas lay one egg, which hatches after about ten days. The milk the female offers a newly hatched echidna is so rich in iron that it’s pink. Newborns live in burrows for three months or so (the only time in their lives echidnas live in burrows), and then begin exploring. However, because they are born without spines, they are vulnerable for about the first year. Echindas then live for 30 to 40 years, though some have been known to live almost to 50. Wildlife is fascinating everywhere in Australia. However, there are places it is more concentrated, usually due to the presence of a better supply of food and water. Tasmania offers much that makes life easier for critters, from abundant greenery to rivers and surrounding ocean full of fish, as well as the abundant flowers and foliage that not only feed animals but attract the insects some animals fancy. As a result, there is a considerable amount of wildlife, much of it readily visible. While I did visit a wildlife park, even in the national parks and wilderness areas, animals were very much in evidence, often attracted to places humans might gather, in hopes of a handout. Among those eternally hopeful of treats or the remains of one’s picnic lunch, the wallabies were both the most common and the most endearing. 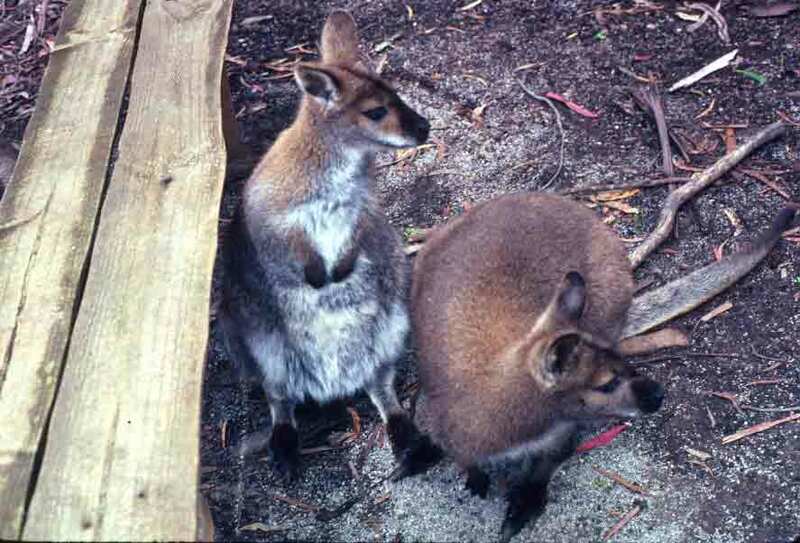 Below are a couple of wallabies who had approached me, but looked away momentarily when someone else came into view. Of course, I once again became the center of attention when I pulled some vegetable treats out of my jacket pocket. I can hardly say how much I loved these lovely, gentle little creatures. 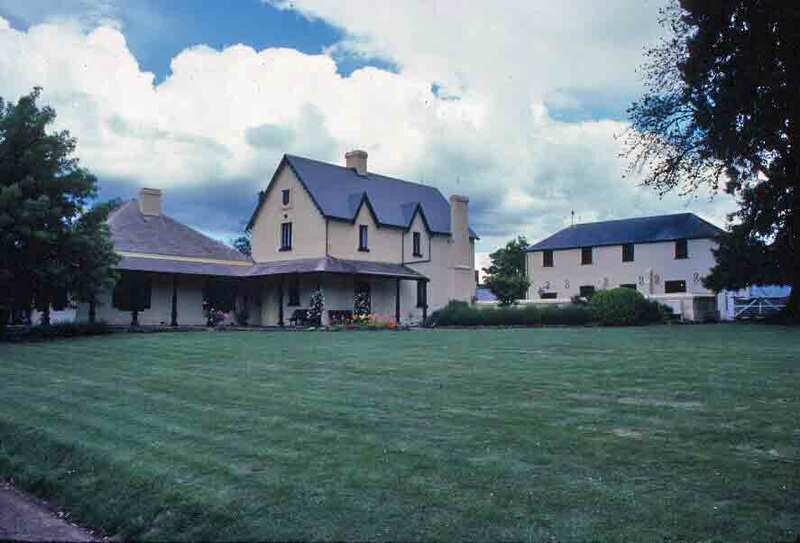 Our next stop, Entally House, is one of the oldest mansions owned by Australia’s National Trust, and is the most historic of the Trust’s holdings in Tasmania. It is part of a story that is so Australian, it would be unbelievable if it weren’t true. While my book details the numerous fascinating buildings and remarkable collections at Entally House, here, I thought I’d share a bit of the history. In 1790, at that age of 13, Mary Haydock of Lancashire, England, had the poor sense to ride a horse that didn’t belong to her, which resulted in her being convicted of horse stealing and being sent to the recently established colony of Australia. She was 15 by the time she set sail for Sydney. It was a long trip, and on the way over, she made the acquaintance of a young Irishman who worked for the East India Company. In Sydney, Mary was assigned the job of being a nursemaid in the household of the colony’s acting lieutenant-governor (the sort of assignment that underscores the fact that the British government knew that most of the offenders they were transporting were not dangerous criminals). When the young Irish merchant from her ship, Thomas Reibey (also spelled Raby and Reiby at various times), returned to Sydney from his travels, he applied for a land grant and permission to marry the little convict girl, now 17. It was to be a remarkable partnership that would build not only a hugely successful importing business, but would also produce seven children. Because of his association with the East India Company, Thomas named their trading business Entally House, after a suburb of Calcutta. When Thomas died, Mary continued to build the business and raise her family. All the children grew up to be major players in the growth of the young colony, and today, Mary appears on the Australian $20 note. But on to Tasmania: The eldest of Mary’s children, Thomas Haydock Reibey, was drawn to Tasmania by the shipping and trading interests that had made his parents wealthy. He, too, became successful and wealthy, acquiring land, cattle, sheep, and horses. Around 1819-1820, he built Entally House, named for his father’s business. In 1821, Thomas’s son, also named Thomas, was born. This Thomas went into politics, held a seat in the House of Assembly for almost 30 years, and even served for one year as Premier of Tasmania. He retired from politics in 1903 and died at Entally on February 10, 1912. So definitely a family firmly anchored in the history of Tasmania. Entally House was opened to the public by the National Trust in 1948. The beautiful main house and many other buildings on the property have been carefully restored to show what it was like in its early days. It is a handsomely elegant home, the interiors reflecting subdued tastes of the British gentry, with much dark wood and clean lines. 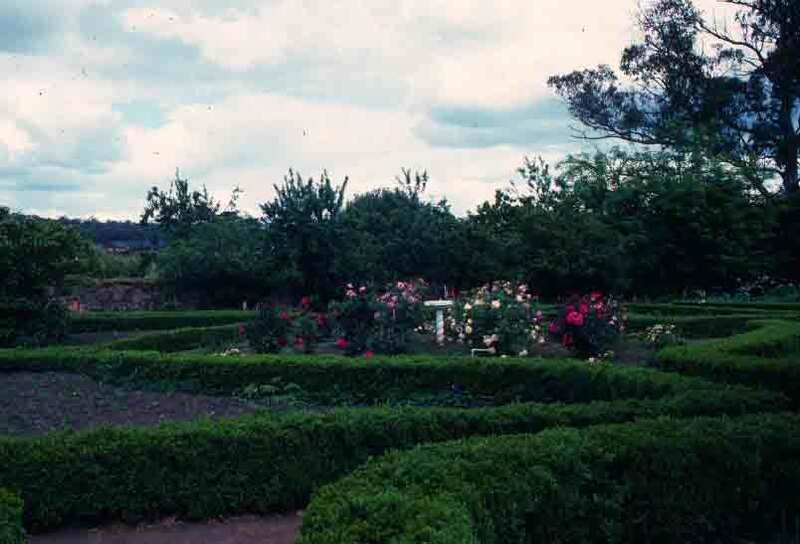 The gardens also remain in tact, with an abundance of roses, which also reflect British tastes. Also on the grounds of the historic home is Australia’s oldest cricket ground. Thomas Reibey had been keen on sports. The photo on the left shows the main house at center and left, with the stables visible to the right, behind the wall. Perhaps it was because I was still so weary and battered from my riding trip, or perhaps it was because I missed the silence of the mountains, but when we stopped at Cataract Gorge, I escaped the crowds and headed up a lonely path that carried me up a cliff face and far into the gorge, to a spot where I was surrounded by trees and wildflowers. Which is not to say I wasn’t interested in Cataract Gorge. I was just interested in it for a different reason than most of those visiting. The gorge’s river empties into a broad expanse known as Launceston Basin. 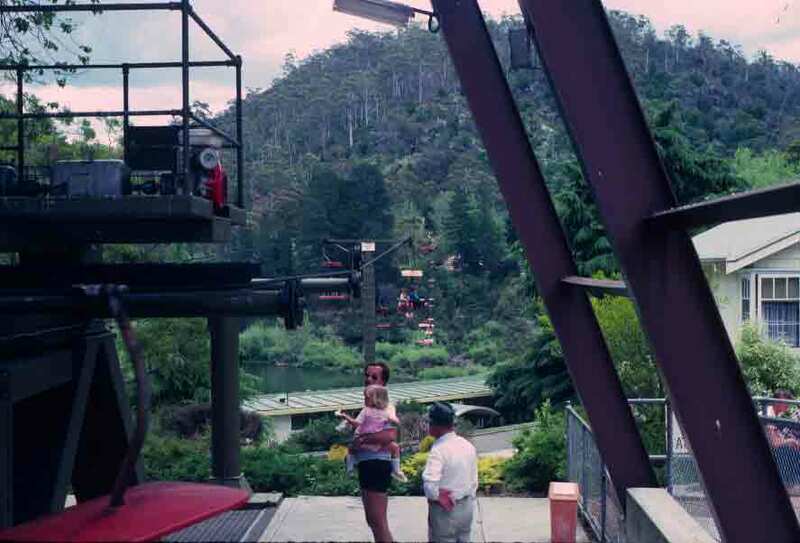 This is the site of the Launceston Basin Chairlift, which is said to have the longest single chairlift span in the world. It’s not the longest chairlift ride, just the longest distance between supports—1500 feet—which is why it dips so low in the middle, as you you can see in the photo below, on the left. I photographed it, but was more interested in “getting back to nature” than riding across the gorge. You can see where I ended up in the photo on the right—looking back toward Launceston Basin, which is only barely visible. When one speaks of South Pacific islands, there are a variety of images that immediately come to mind. However, none of those images are likely to match what Tasmania looks like. Despite being an island in the South Pacific, it is in a mild but far from tropical climate zone, and as such, looks more like northern England than South Pacific. 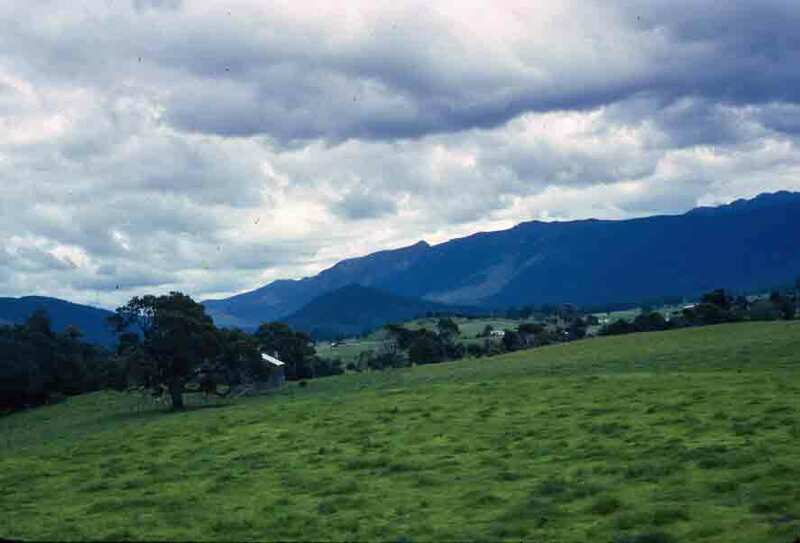 Tasmania is well watered, which makes it ideal for both agriculture and hydroelectric energy. It also makes it immensely green. Everywhere you look, it’s green. 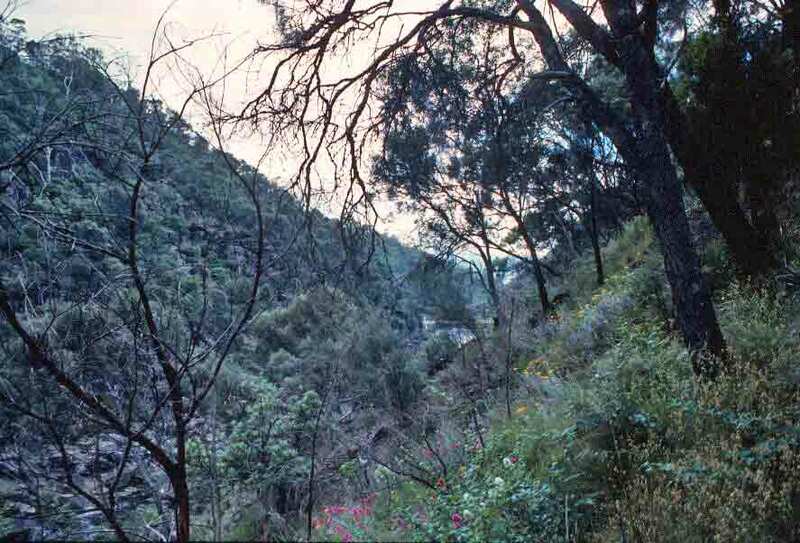 The island is actually the continuation of the mainland’s Great Dividing Range, so it is quite mountainous. It is also heaven for lovers of wildlife. I think the photo below gets across a little of the intensity of the greenness of Tasmania. It is not the olive green of South Australia and Victoria. It is the deep green more familiar to those of us from the northern hemisphere. Before transitioning to Tasmania, however, I thought I’d step outside the flow of my adventures to comment on visitors to my blog. It’s always fun to connect and know one’s words are being read. This year, my book, Waltzing Australia, got added to the recommended reading list at a New England university, and I have loved hearing from students who enjoyed reading it. As is common on the Internet, I’ve had visitors from all over he world. However, it is clear that a solid (though not overwhelming) majority of visitors are actually from Australia. It is of course a real delight for me to connect with people in Oz who also love the many places I’ve traveled—a way for me to stay connected to Australia. I do chuckle sometimes when there are suddenly 30 hits on “When were water buffalo introduced to Australia” or “history of Perth’s Old Mill.” “Sturt desert rose” and “termite mounds” have also witnessed sudden bursts of interest. I imagine some teacher somewhere in Australia handing out an assignment and a whole classroom of kids finding my site. Given the fact that a good chunk of my income is from educational writing, I find this not only amusing, but immensely gratifying. However, that’s still just a small percentage of the lovely visitors I’ve welcomed to this site. Thank you to you all. I’ve enjoyed your comments. Anyone who has visited my other blog (The World’s Fare) knows I’m a foodie, as well as a traveler. I’ve written elsewhere on this site, and have spoken often about the joys of dining down under. I do want to remind folks that, especially for my first trip, I was living on a budget, but the abundance of lamb, seafood, and exotic fruits, as well as the abundance of ethnic cuisine, made it possible to dine splendidly even with little money. However, for those who go to Australia with stacks of cash and who want to unload it on food, there is ample opportunity. As a sampling of the delights awaiting the well-heeled diner, here’s a video from Gourmet magazine’s TV program Diary of a Foodie, about a few of the glories of Tasmania’s culinary scene. Just one more reason I love Australia—and need to get back before too much longer.